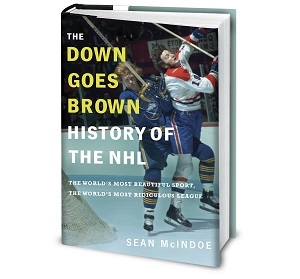 Down Goes Brown: Whatever happened to the NHL trade market? Wednesday marks one of the most anticipated days of the hockey calendar: the 2014 NHL trade deadline. That means the league’s 30 general managers have less than a week left to work the phones in an effort to reshape their rosters for the playoffs. This year’s deadline could be shaping up to be a busy one, at least according to the omnipresent rumor mill. Martin St. Louis and Ryan Kesler may have asked for trades, and the Rangers are apparently all but certain to move captain Ryan Callahan. Thomas Vanek and Ryan Miller should be on the move, too. It could all make for a fun day, which would be a nice change after a recent trend of deadline-day letdowns. • Rental deals, where a bad team trades one of its better players to a contender for futures, conceding it’s unlikely to win now but is hopefully speeding up the arrival of the day that it will. This is where players like Miller and Vanek should come in, along with plenty of third- and fourth-line depth guys. • “We have no choice, so we’ll take what we can get” deals, where circumstances force a team into moving an asset for 70 cents on the dollar. Callahan, Kesler, and St. Louis could highlight this category. • A guy you’ve never heard of for another guy you’ve never heard of. None of it will be new. The NHL has always featured plenty of these types of trades, and probably always will. But there’s another type of deal that used to rule the NHL’s trade market, and it was by far the most fun: the actual honest-to-god hockey trade, in which there was a good player (or more) on both sides of the ledger. These deals weren’t about rentals or rebuilds or kicking the can down the road. They were two teams, both trying to get better by aggressively addressing areas of need. Remember LaFontaine-for-Turgeon? Hawerchuk-for-Housley? Chelios-for-Savard? Clark-for-Sundin? The six-player Ron Francis deal between the Whalers and the Penguins? The 10-player Doug Gilmour deal between Toronto and Calgary? Going back even further, the six-player Esposito-Park deal between the Hawks and the Bruins? Those are just a few examples of the types of true blockbusters hockey fans used to wake up to. And they were, to put it bluntly, awesome. Seeing two NHL teams step up and slam their cards down on the table was great fun, and throwing around rumors and possible scenarios was, too, because there was always a chance it could actually happen. In contrast, there have been 31 NHL trades made since September 1, which sounds like a lot. But look at this list. Forget about blockbusters — how many of those trades are even interesting? Not many. And how many include a star player going each way? None at all, unless you’re feeling charitable to Matt Moulson. The rest are all cap headaches, castoffs, and future considerations. If the NHL had banned trading during the 2013-14 season, at this point the league’s balance of power wouldn’t be noticeably different at all. So, what happened? What killed the art of the blockbuster in the NHL? There are a few suspects, and we’ve rounded them up below. Well, duh. The cap is the big factor that always comes up whenever trades are discussed. At this point, it’s practically mandatory that any story that mentions a trade must include an obligatory reference to how the salary cap makes everything so much harder for everyone. In a salary-cap world, where so many franchises are tight against the upper limit, the thinking goes, teams are essentially forced to balance the dollars on either side of a deal as much as possible. That severely limits their options. And that’s especially true if they’re trying to deal a star player who has a big cap hit. There’s no denying the cap has been a major factor in slowing the trade market. But when you look at the actual numbers, it’s hard not to wonder if its influence is being overstated. For one, unlike the NBA, the NHL doesn’t have any complicated rules and exceptions about how salary balances out in a trade. If two teams want to swap an $8 million player for a $1 million one, then they can either afford it under the cap or they can’t. The rules are pretty basic. But isn’t the problem that nobody can afford to make a move? Well, yes and no. For all the talk about everyone being up against the cap, the truth is that many teams aren’t. Half the league has at least $5 million in cap space today, and a third of the league has at least $10 million. (As always, all cap numbers are courtesy of the indispensable CapGeek.) Of course, many of those teams are working against their own internal budgets, but teams have always done that. If a team like Florida or Ottawa that’s always crying poor can’t afford to make a deal, that’s hardly the salary cap’s fault. But even the teams that do spend close to the cap can have more room than you’d think, at least by the trade deadline. The cap is prorated over the course of a season, so a team acquiring a player tomorrow is responsible for only the last two months of this year’s hit. Even big-dollar players can fit into many teams’ caps by the deadline with little if any salary coming back. For example, there are 24 teams in the league that have enough room to add a $3 million player at the deadline. That’s 80 percent of the league (and the Flyers and Sharks are just short). Even supposedly “capped out” teams like Boston, Toronto, and Vancouver have at least that much room to work with. Granted, $3 million won’t get you a superstar these days, but you’d think it would be more than enough room for a creative GM to get to work. And all that’s true without factoring in that teams can now retain salary when trading a player. This was a change Brian Burke lobbied for, in the hopes it would make it easier for GMs to make deals. The new rule came into effect last year, and has been used a handful of times, most notably when the Sabres traded Vanek to the Islanders. But overall, it hasn’t seemed to loosen the trade market significantly. It should go without saying that teams that plan to spend near the cap still need to watch their dollars carefully, especially when it comes to long-term commitments (though that doesn’t seem to stop them from going crazy during free agency). But the truth is that as the season goes on, the vast majority of teams in the league have the cap room to make significant deals. And yet they rarely do. The cap is a major factor, but something else must be going on. I guess the Blues read your article.